There are many options in which you can choose when it comes to auto shipping. However, the most popular methods are open and enclosed types of car transport. The first method of car shipping (open car shipping) is for those who seek a more affordable alternative. In contrast, the second method is the best option for people for who want ultimate safety for their vehicle. Even though enclosed auto transport type of service is a bit more costly it is the best option for vehicles that have a higher price tag such as exotic or classic cars. San Diego Auto Shipping has all methods of vehicle shipping services available for its customers. In addition, we ship all kinds of vehicles across 50 states of the United States, including Alaska and Hawaii. If endangering your vehicle because of being in an open trailer is not for you we can provide you with San Diego enclosed car carriers. Moreover, if you choose our enclosed auto transport service your vehicle would be in a safe trailer free from street dirt and dust. Our company recommends enclosed auto Transport for those who own retro cars, exotic cars, sport cars or any other vehicles that have a special value for you. 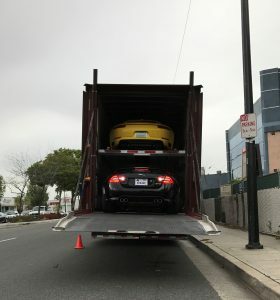 We use enclosed auto transport as a standard method for our San Diego Luxury Car Transport. We know how to treat the most expensive cars appropriately. Also, our skillful drivers will take care of your vehicle and make sure it travels safely to your desired destination. San Diego Auto Transport also offers full insurance coverage with our car carrier for the time of the transporting process. Get a free quote from San Diego Auto Shipping. You can also request it online or over the phone. We are looking forward to transporting for you!